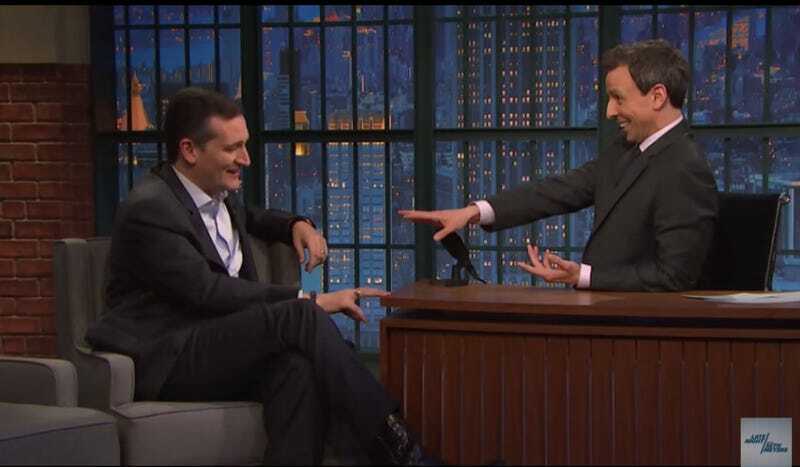 Seth Meyers had Texas Senator and coy not-yet-presidential-candidate Ted Cruz on the show last night; in a genuinely impressive display of ballsiness, he joshed Cruz for terrifying a three-year-old and for not believing in climate change. Meyers also made fun of Cruz for his word choice: "At first I got excited because I thought you were coming around on global warming," he said, to laughter and applause. "Because I think the world's on fire literally. Hottest year on record. But you're not there, right?" Cruz responded by claiming that "the debate should follow the science" on global warming and that, as a huge science fan, he happens to know that "satellites" and "cables" show the world isn't warming; Talking Points Memo points out he appears to be referring to a now-discredited 2011 study by a climate change skeptic and intelligent design fan named Roy W. Spencer; the editor of the journal where the study was published later resigned after admitting the paper was "fundamentally flawed" and hadn't been properly peer-reviewed. Good references, Ted. Very current. The full clip is here; while Meyers certainly could have pressed Cruz more on this fascinating cables theory of his, this clip is definitely going to come up again during debates on the senator's creative views regarding science.